@ Thomas, looks good to me. Now I just gotta earn it. An all time fave and on it's way from Sprue Brothers as a Father's Day giftie. Decisions, decisions. Time will tell, I suppose (after I get a couple of other projects out of the way). Michael, you do have a problem. I could not make that decision. for me is easy...... KFIR!!!! Welcome aboard Carlos!!!! I will follow your F-1!!!! Kind of thought that's the way you'd vote, Jose! 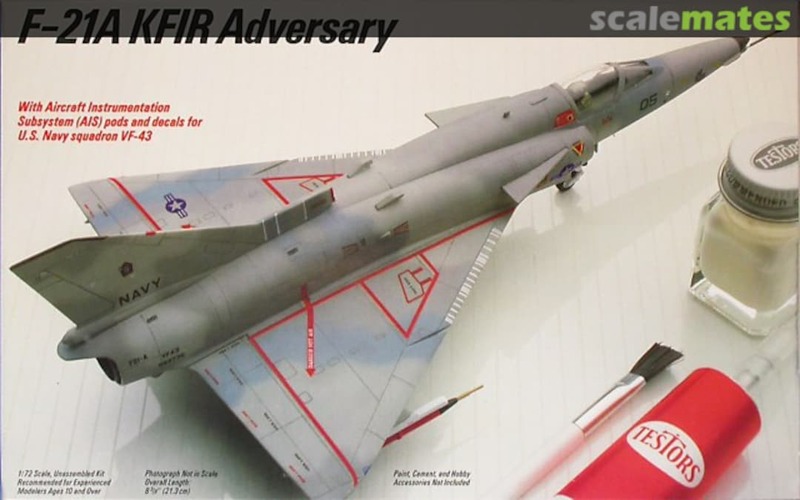 Just to be clear, though; if I do the Kfir, it will be Israeli. I have both kits safely in the stash now, just need to finish up a couple of other projects that are almost done, and then the decision will have to be made. Sounds like Kfir will be well represented in this campaign. I'm planning on the USN adversary flavor. What kit will you be building? 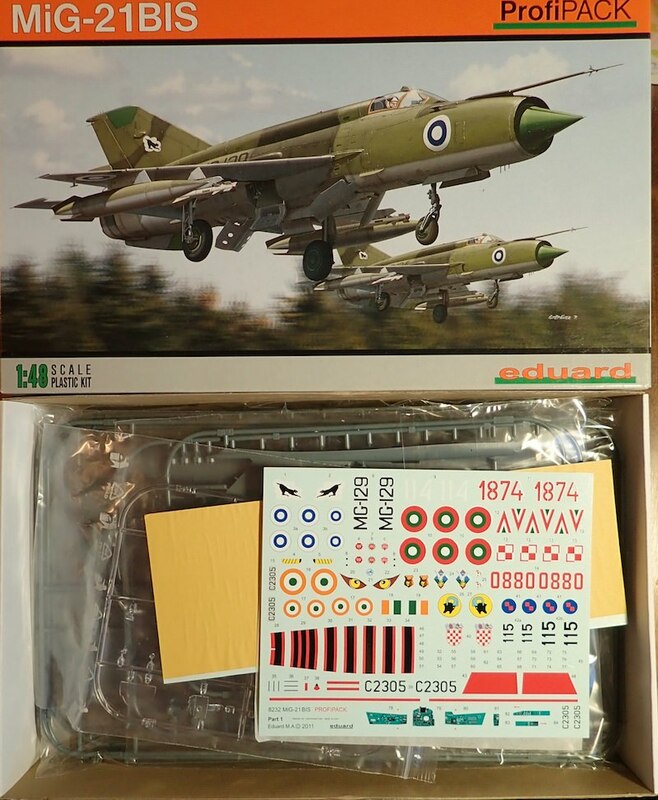 Testors F-21 Adversary rebox of the Italeri (ESCI?) kit. To save costs, they only reproduced 1/3 of the decals. The 1/72 kit? I think that's original Italeri. 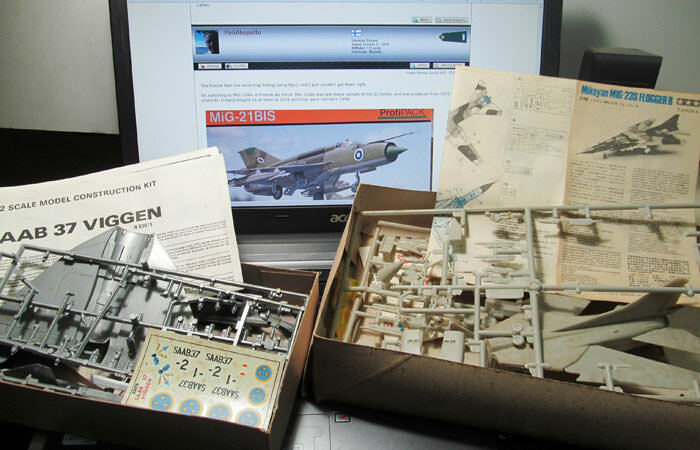 The Italeri 1/48 kit came from Esci, but I think the 1/72 kit is all theirs. I hope it's fun. 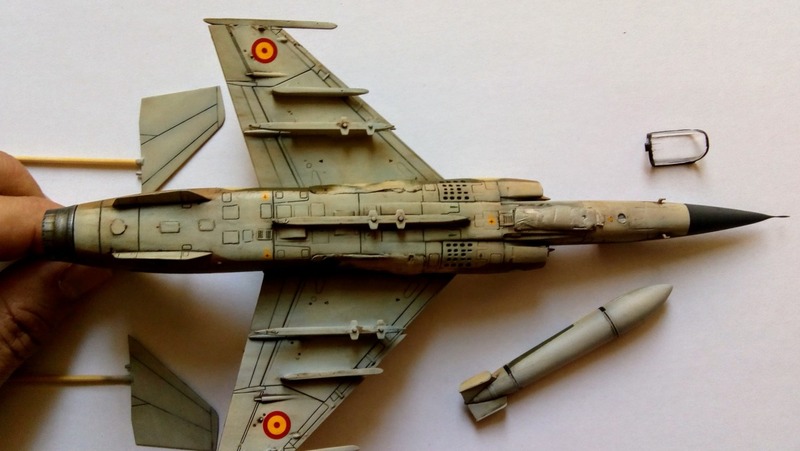 Never done an aggressor camo and the odd decals have you painting to fill in a white spot on a decal?? That's weird! Wonder what decal that would be? Well, good luck, my friend! Well, if it worked, there is a "No Step" stencil on what I guess is a speed brake. On the bottom of the A/C that shape calls out for white paint. Well, those are indeed speed brakes. I have the IsraDecal sheet for U.S., etc. Kfirs and it shows the Navy/Marine aircraft had the lower brakes in white with red borders. So, assuming the decal is a red border, that should be correct. 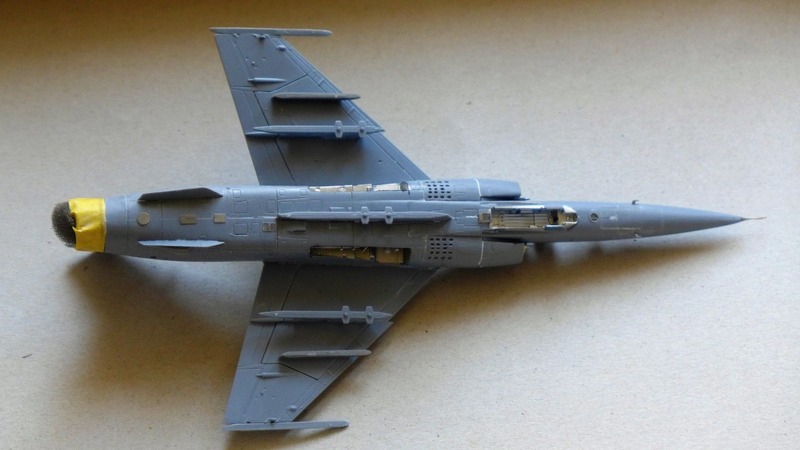 We probably ought to stop hijacking this thread with Kfir discussion. But I'm looking forward to your model! one last time, I ought to read more closely, the art shows a paint callout for the brake, but the decals clearly have the white printed in. Guessing that's a combination of instructions from one source and decals from another. I don't expect you have to paint it white if it already has white decal (unless they know their white decal is translucent.) That's what happens when one company reboxes another company's kit, I suppose. Rear fuselage box was bent sideways, and used steam and thick gloves to bend it symmetrical (when viewed from front). Also top plate was bent, but to a lesser degree. Now air intakes fit fine, engines are installed and also nose halves seem to fit quite nicely. Not Tamiya-nicely, but in a way that doesn't require loads of sanding. Rear fuselage box is about 1.5 mm wider than cockpit and air intakes, so I deviated from instructions and glued in intakes first. It's easier to hide the extra between intakes and cockpit than it's on very visible fuselage sides. That's also why I've removed the three large locator pins. 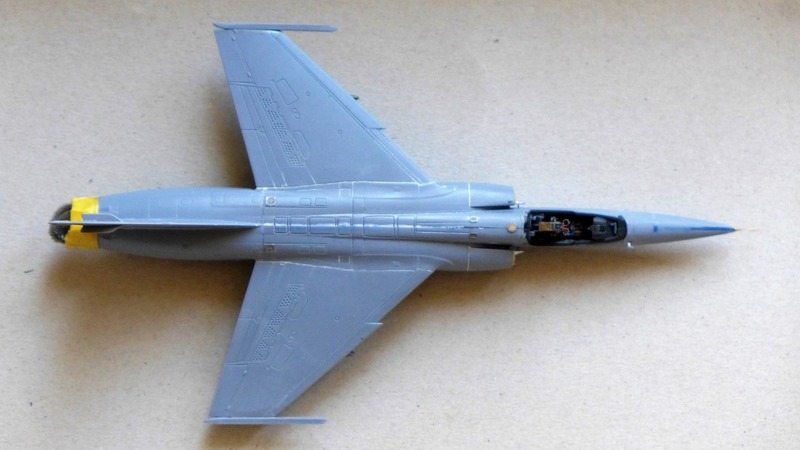 Pasi, I love mig25, build is looking great. I took that model off my wish-list after I watched a build review, I don't think I have enough skills or patience for it. I love the model and even when fit is not perfect and I had to use putty nearly everywhere, nothing was particularly challenging. I an really enjoying the build. I am slowly progressing through the build. I have done painting and decals. Things were going well until I went a bit too heavy with the panel line oil wash, and washed away some on the paint. I am trying to touch up here and there but here is an update after the panel line oil wash. This one'll be out of the box except for a stray resin ejection seat I found in the spares box. Thanks Michael, I will be following your Kfir. 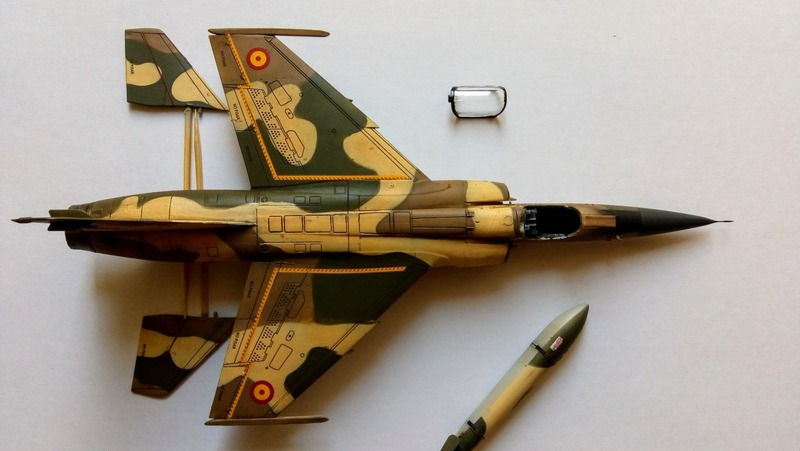 I am done now with my Mirage F.1. Several small mistakes but I am really pleased with how it looks and the weathering. Next time I will use more masking tape to avoid over spraying, I had to repaint lots, and I will use more gloss varnish, I washed away the main colours with the panel line wash. The Foxbat had one more trap hiding (wing tips), and I just couldn't get them right. 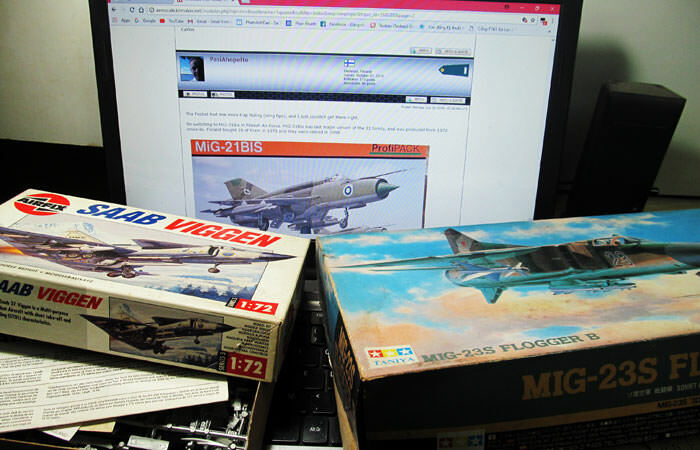 So switching to MiG-21Bis in Finnish Air Force. MiG-21Bis was last major variant of the 21 family, and was produced from 1972 onwards. Finland bought 26 of them in 1978 and they were retired in 1998. I got a pair of kit to this campaign. I think MiG-23 of Taniya (?) is a faked product of Tamiya. Those instructions have a definite Hasegawa-like look to me. I was a little disappointed to find no intake trunking, but given how close the intakes fit, you really couldn't see anything anyway.